This species is accepted, and its native range is S. Tanzania to S. Tropical Africa. Trailing or twining herb up to 45 cm long, arising from a perennial woody rootstock. Leaves 3-foliolate; leaflets 2.6–9 × 0.7–2.6 cm, oblong-elliptic, the lateral leaflets slightly oblique, all leaflets with midvein not central, subacute or obtuse at the apex, apiculate, rounded at the base, appressed pubescent on both surfaces; petiole 2.2–6 cm long; rhachis 1–4 mm long; petiolules 2 mm long; stipules 4–8 × 2–3 mm, ovate, striate; stipels 2 mm long, filiform. Flowers axillary, solitary, in pairs or in 3-flowered fascicles; pedicels 3–5 mm long, bracts 3–5 mm long, lanceolate, striate; bracteoles 2 mm long. Calyx tube 2–4 mm long, sparsely spreading pubescent; lobes 2–4 mm long, triangular, spreading pubescent, the upper pair completely fused. Standard greenish-cream tinged purple inside or greenish-yellow with purple-red blotch, 12–20 × 12–17 mm, broadly elliptic, emarginate at the apex, with 4–6 mm long linear appendages; wings 11–14 × 1–2 mm; keel 12–15 × 2–4 mm. Ovary 5–6 mm long, linear, appressed pubescent. Pods 5.8–8 cm × 5–6 mm, compressed, linear, glabrous, pale green; beak 1–3 mm long. Seeds reddish-brown, up to 5 × 3 × 1 mm, compressed; aril poorly developed. Perennial herb, some shoots erect at first, others trailing or twining, up to 45 cm. long; rootstock thick and woody. Stems covered with spreading hairs. Leaflets 3, oblong or elliptic, the laterals slightly oblique, 1–8 cm. long, 0·4–3 cm. wide, obtuse or subacute at the apex, narrowed to a ± rounded base, adpressed pubescent on both surfaces; petiole 1·5–6 cm. long; rhachis 0–2 mm. long; petiolules 2 mm. long; stipules ovate or ovate-lanceolate, 4–10 mm. long, 2–4 mm. wide, ribbed. Flowers 1–3 in axillary fascicles; pedicels 3–5 mm. 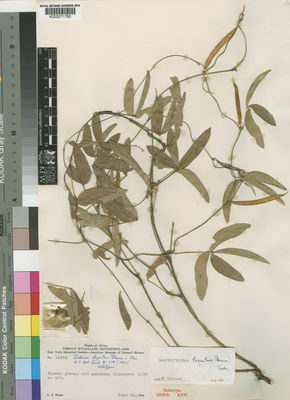 long; bracts ±1·5 mm. long; bracteoles lanceolate, 2–3·5 mm. long. Calyx spreading pubescent; tube 2·5–4 mm. long; lobes triangular, 2·5–4 mm. long, the upper pair completely joined. Standard greenish-cream outside, tinged reddish-purple inside, or greenish-yellow with purple-red patch inside, rounded-obovate, 1·2–1·7 cm. long, 0·9–1·5 cm. wide. Pods linear, slightly curved, 5–8 cm. long, 5–6 mm. wide, margined, beaked, glabrous or almost so. Brachystegia, Uapaca woodland; 970–1500 m.
Verdc. in Kew Bulletin 24: 403 (1970).